The Louisiana Real Estate Appraisal Board (LREAB) has again taken action to ensure that Customary and Reasonable (C&R) Fees are being paid by AMCs and lenders in the state. On December 8, 2015, after a hearing that lasted over 12 hours and was closely watched and attended by appraisers, AMCs, and lenders alike, the Board ruled against iMortgage Services, LLC and issued a Final Order that included a fine of $10,000 and a six-month license suspension. The suspension was stayed, provided that iMortgage provides a C&R compliance plan to the Board no later than March 21, 2016. In contrast to Louisiana’s previous C&R enforcement action involving Coester VMS, where there was no admission of guilt by Coester, this is the first judgement against an AMC that leaves no question on the determination of guilt. The Board’s final order establishes that iMortgage failed to comply with Louisiana law and violated the C&R fee requirements set in place by the Board. Demonstrating the glacial speed at which many state board investigations operate, the initial complaint against iMortgage was filed two years ago in January 2014 after iMortgage sent out an appraisal order for a full 1004MC FHA appraisal with a fee of $200. The investigation was not opened until May 2014, with the hearing taking place in December 2015. Kelker writes that iMortgage works on a cost-plus basis, having been provided a minimum fee for each geographic market by Flagstar. iMortgage then adds a “service fee” to the appraiser’s fee in order to develop a final borrower cost for the assignment. In addition to the Flagstar fee survey, Kelker says that iMortgage also determines fees based on its “experience in the market” and the fees that appraisers quote and accept within particular local markets. Kelker argues that iMortgage complies with both C&R presumptions of compliance, as it relies on what he says is an independent third party fee study (Flagstar’s study), as well as iMortgage’s internal market data regarding what it has been paying appraisers and what appraisers have been accepting. It is worth noting that that the language of the C&R fee provision of Dodd Frank states unequivocally that “Fee studies shall exclude assignments ordered by known appraisal management companies.” However, because iMortgage did not know the details of the fee survey, it is unknown whether the Flagstar survey, which served as iMortgage’s first line of defense, used AMCs fees in its determination that $200 is C&R for a 1004MC FHA appraisal order. In his letter to the Board, Kelker raises his objections with Dodd-Frank, writing that iMortgage’s problem with “broad fee studies,” possibly referencing the Louisiana Board’s fee study, is that they are “general in nature and do not specifically encompass the scope of work associated with an individual mortgage assignment.” Furthermore, Kelker writes that any fee studies that “specifically exclude appraisal management companies in their composition create a potential bias due to the significant participation share of AMCs in the mortgage market.” While contrary to the wording of the Dodd-Frank C&R fee provision, this sentiment echoes many other AMCs that insist that the fees they pay should be included in fee surveys and that fees consistently paid by AMCs constitute C&R fees because appraisers are accepting them. After submitting the documentation requested by the Board, including appraisals ordered by iMortgage in Louisiana from December 1, 2013 to July 1, 2014, iMortgage was served with a preliminary notice of adjudication in November 2014. It cited iMortgage with 150 violations of failure to pay C&R fees. After discussions with the staff of the Louisiana Board, 141 of the alleged violations were dismissed- with only nine violations remaining by the time the hearing took place in December 2015. The reason why may be news to appraisers. One nuanced point that will be of interest to appraisers is that the initial order of the 1004MC FHA appraisal, that began the investigation, was not one of the nine violations that iMortgage was ultimately charged with. According to the testimony of Robert Rieger and Kellen Mathews, iMortgage’s attorneys, the 1004MC FHA appraisal did not meet the definition of a federal covered transaction, and therefore, the Dodd-Frank C&R fee provision did not apply. Based on the hearing transcript, dozens of the originally noted 150 C&R violations against iMortgage were dismissed because they were deemed to be transactions “not covered” or having no C&R fee protection under Dodd Frank. A careful reading of Dodd-Frank reveals that Section 129E, which includes the Appraiser Independence and C&R fee provisions, applies specifically to “consumer credit transaction(s) secured by the principal dwelling of the consumer.” In other words, appraisals for foreclosure and REO purposes, investor purchases and refinances, and any other transaction not involving a credit transaction secured by the “principal dwelling of the consumer,” are not regulated nor covered under these important sections of Dodd-Frank. As a result, appraisers cannot rely on the protections of the appraiser independence and C&R provisions of Dodd-Frank for a large variety of appraisal transactions. Though appraiser independence in covered by other federal statutes. This point is not widely known by appraisers, nor was it immediately clear to the Board’s investigators. Only later in the investigation process were the 150 appraisals in question examined to see if they were covered transactions, at which point a large segment of them dismissed. The Louisiana Board did not immediately release the transcript of the hearing on December 8, which lasted over 12 hours. Working RE requested the transcript directly following the hearing and has just recently received a copy. The transcript is nearly 100,000 words and 500 pages long in its original form. Judge Darrell White presided over the hearing, with the Board serving as the jury and maintaining responsibility for rendering a decision. Throughout the hearing, several facts were brought to light that are of concern to appraisers. iMortgage’s lawyers spent the better half of the day questioning the two investigators regarding the Board’s rules and procedures for an investigation, hoping to uncover and prove that the investigation was conducted sloppily and in violation of the Board’s own rules. The attorneys argued that missing or incomplete notes were made in the files regarding the investigation, that investigators improperly handled certain administrative items, and that standard investigations are supposed to be completed within 120 days, while the investigation against iMortgage dragged on for months at time with no action taken. iMortgage’s lawyers then called a William Wade Matchneer III as a witness in the case, an attorney who served as past senior counsel for the Consumer Financial Protection Bureau. Through examination and cross-examination, Matchneer highlighted an important point regarding Dodd-Frank’s two presumptions of compliance regarding C&R fees, stating that “a presumption is just a suggestion. It’s not a requirement.” In other words, complying with one of Dodd Frank’s C&R presumptions of compliance is a way to be sure to comply with the C&R fee provision, but it is not the only way to comply with the law and an AMC may claim to have complied in a different fashion. Matchneer also revealed that his presence at the hearing was, in part, due to the Real Estate Valuation Advocacy Association (REVAA) putting him in touch with iMortgage’s attorneys. Jeff Dickstein, the Chief Compliance Officer of Pro-Teck, a member of REVAA, also appeared as a witness on iMortgage’s behalf. At the end of the day, the final witness called to testify was Dean Kelker, iMortgage’s Chief Risk Officer. Kelker’s testimony centered around the Flagstar fee survey that was used for the nine appraisals found in violation by the Louisiana Board. Kelker argued that iMortgage was required to use the fee schedule it was provided by Flagstar as a condition of doing business, and because the fee survey was conducted by Flagstar, it was objective and independent, and consequently iMortgage was in compliance with Louisiana and Federal laws. The affidavit goes on to explain that in addition to Trice’s data, Flagstar also used its own knowledge of the market to develop a proprietary fee survey. However, upon closer examination, Kelker admits that he has no knowledge of the details of how Flagstar’s survey was compiled or conducted. Kelker later clarified that he did not know how many parishes Trice surveyed or whether a formal survey was published at all. “If we are going to differentiate between the data and a survey, she did not publish a survey. Flagstar used her data as part of their data. They also used their own internal experience that may have included broader data. I don’t know. I don’t know if they had complete survey data from the state of Louisiana. I didn’t see it,” says Kelker. Kelker continued to assert that it was an independent fee study, as it had originated outside of iMortgage. Edwards, the Board’s attorney, strongly questioned the independence of a fee survey conducted by a lender and delivered to its agent, an AMC, and pointed out that there was no way of knowing whether the survey, or data compilation (as Kelker puts it), was conducted in compliance with state and federal law (excluding AMC fees). When contacted for comment, Joan Trice explains that the data being referenced is ClearBox data and that the fees in ClearBox are input by appraisers per county, per product. “It is not anonymous, so these are real appraisers setting their fees. The fees presented are what appraisers charge for both lender and AMC clients. ClearBox does not create a fee schedule, it merely presents the data to AMCs and lenders. Anyone can be a subscriber and get access. We are agnostic on how somebody analyzes or uses that data. We tell you what the general population is, what the appraiser ratio is in a given area, the VA fee schedule, the academic studies available in the six states that have them, and more. Our goal is to give our clients as much data as humanly possible,” says Trice. “It’s simpler to comply with the law than trying to debate or challenge whether or not people like Dodd-Frank. I think it’s pretty clear what C&R fees are, and compliance is not that difficult,” says Trice. While not related directly to C&R fees, Kelker also revealed a fact that some appraisers may find unsettling. During examination, Kelker testified that iMortgage does not allow any appraiser on their panel with a disciplinary action. Kelker reveals that many of iMortgage’s lender clients do not allow appraisers with disciplinary actions and states that “any appraiser that is involved anywhere in the transaction that has disciplinary action, whether it is the original appraiser, the review appraiser, whatever, whoever has disciplinary action automatically loses in that deal,” says Kelker. Kelker’s comments confirm what State Board complaint experts such as Bob Keith, MNAA, IFA and Tim Andersen, MAI have been saying for years, that a disciplinary action, even a minor one, can have a lasting effect on an appraiser’s career and lead to the loss of both current and future clients. Appraisers who are faced with state board consent decrees or who are pressured into admitting guilt should take extra care and seek the advice of experts before signing off, as the long-term ramifications of a guilty judgement can be severe, even if the complaint is frivolous or minor. In her closing argument, Edwards argued that the hearing proved the allegations against iMortgage set forth in the written complaint, and that the Louisiana Real Estate Appraisers Board licensing laws and rules had not been followed. “They’re sound rules. They may be a little bit more strict than the federal rules. They are allowed to be as long as they’re not in conflict,” Edwards says. The motion was passed unanimously by the Louisiana Board. The Board then moved to fine iMortgage $10,000 and impose a six month license suspension, which was stayed pending the Board’s review of iMortgage’s new compliance plan on March 21, 2016. Click here to read the Hearing Transcript in its entirety. For a webinar on how to effectively handle state board complaints, provided free to all appraisers by OREP for a limited time, please see Fighting Appraisal Board Complaints: An Expert’s Advice. The presenter, Bob Keith, MNAA, IFA is the former Executive Director and Compliance Coordinator for the Oregon Appraisal Board and also provides consulting services on how to deal effectively with state board complaints. OREP members enjoy the initial consultation free. 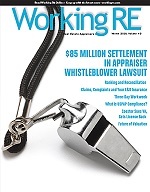 Tim Andersen, MAI, provides workfile-review consulting services to show appraisers how to avoid common workfile issues that can result in a board complaint. Anderson’s services are discounted for OREP members. 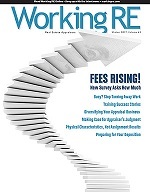 For more on either of these two services, please email subscription@workingre.com. CU Version 3.1 went live on December 12, 2015 and it’s introducing new red flags and warning messages related to adjustments, view and location data, accessory units, condo data, and much more! 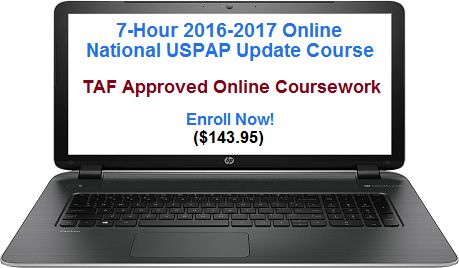 See the latest as Hagar shows you what’s new takes you step-by-step through the new warning letters appraisers have been receiving due to CU’s new changes. Sign Up Now! Save $48 when you purchase the Winter Series Season Ticket! My appraisal career began in 1991 when the fee for a full (1004) was $350 in my area. 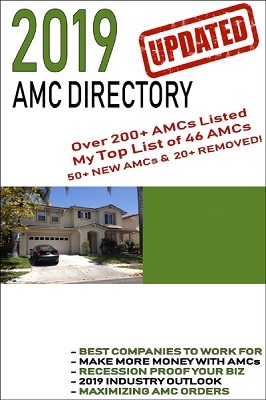 AMC’s continue to tell me that most appraisers in my area are accepting a fee of $300 to $350 today. 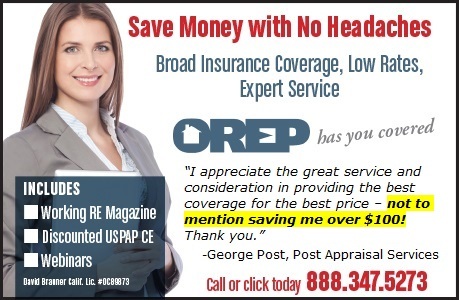 I know many appraisers and none accept a fee of less than $400. Most are charging $450 to $500 for a #1004 today. In 1991 this report was 10 to 12 pages in length. Today due to all of the requirements it is at least 25 pages in length. Most AMC’s are paying the appraisers between 50-67% of the fees they collect from the borrower. If you look at the indictment against IMortgages by the Louisiana board on the 9 appraisals, most paid between 54-73% to the appraiser (of total fee charged). The majority of the AMIC’s are still violating the C & R fee regulations. One is well-know, in business for 30 years and owned by an MAI. Another AMC just announced that are charging a “Technology fee” to the appraiser per report for their cost of doing business. I have been in this business 23 years and am thankfully less than 2 years away from retirement. This situation has not improved in the past 10 years and is not likely too, unless the power of the banks to influence legislation is reduced. That is part of the “political revoluton” I personally hope catches on. Flagstar is the worst lende and horribly dishonest. They hate me cause I caught them in their fraud had to get Feds in their backside. Trice is s joke!! Put those two together ? It figures, two bottom dwellers. I won’t work for her either she thinks she is queen of the Industry but really is just another AMC greedy socialist. Thank you, Louisiana and all your appraisers. And thank you Isaac Peck and WorkingRE for sharing. Let us not underestimate the importance of sharing this type information. It helps all of us. A $10,000 fine big friggin deal!!! They were taking in $465 per appraisal. Paying out $250 and then minus a “technology or service fee” They were hauling in $225 per appraisal and 44 appraisals later they’ve paid their “fine” off on the backs of the appraiser anyway. So they got fined. What became of the remedy? What are the appraisers now being paid? I got a call from an “AMC” told me my fees at $330 were too high. They had me rated at “AAA” quality. Told them I’m not working for less. Find someone else. They’ve been paying. I’ve jacked up my fees. STOP working for Minimum wage. You’re all PROFESSIONALS. $50 per hour is “reasonable.” Your auto-mechanic is charging $95 an hour. The banks are making $10,000’s on any deal. CHARGE A REASONALBE FEE!!! Or work like a dog for free. All the efforts to hijack our profession have succeeded. They have circumvented the licensing requirements and now any clerk without appraisal experience is a “reviewer” and can feed your appraisal into a computer designed by and for other non-appraisers in FNMA and tell you what you have to correct before you collect your fraction of a fee. So, an unlicensed clerk working for an AMC (probably owned by a bank) can profit off your license without having any exposure. Those who work for AMCs need to get their fees up to what they need to compensate for their time, education, experience, expenses such as forms, insurance, data, office, mileage, gasoline, etc costs, regardless of what the AMC bloodsuckers want to charge the lender. The lender doesn’t pay the fee, the borrower does, so any effort to de-value our profession is costing the consumer, making us look bad!! Stop blaming the AMC, if we appraisers will stop accepting the low fee and turn down their request, then we can see the turn around in the industry in our (appraisers) favor. Give credit to the LRELB. Great article Mr. Peck! As usual, very detailed information. A few observations though & elaborations. While I love that LREAB is taking some kind of action, it is incorrect to say that their action could or would “ensure c & r fees” are being paid. What it means is that they caved and only gave a major miscreant a wrist slap that will have almost NO impact on how AMCs conduct their business. Imposition of the six month suspension WOULD have been proper and meaningful. There are quite a few statements made by the guilty party and their representatives that are suspect at best, and at worst may actually be the outright lies that some appear to be. (1). Does Kelker really expect anyone to believe that their $200 fees were “in part” based on a survey given to them by Flagstar, that no one can seem to produce? A fee that is so far beyond being ridiculously low as to be an outright insult to anyone it is offered to? (2). A “cost plus” model is one in which a fair, or REASONABLE fee is paid for the specific appraisal challenges involved and where the AMCs fee is added above that. For example: a non complex FNMA assignment in which a 3 year licensed non certified appraiser is hired for a non complex FNMA assignment at $515 and the AMC fee of $150 is added on top. Or, for those AMCs still paying $70 per assignment kickbacks, the “plus” add-on might be $220 for a total paid by the consumer to the bank or AMC of $735. The current national model in which the bank agrees to pay $500 to $550 TOTAL regardless of complexity to almost all AMCs in which the AMC purportedly only takes $150 (or more) and pays the appraiser $350 to $400 (or less) is not exactly cost plus. By the way, THAT is STILL not meeting the reasonable part of C&R. A “reasonable” fee proposal along with support for how the numbers are arrived at can be found at: http://mfford.com/html/c___r_fees.htm or via the links at the American Guild of Appraisers Home page at http://www.appraisersguild.org . (3) iMortgage is being disingenuous when it says it relies on an “independent” third party study such as Flagstar…FLAGSTAR IS THE / A CLIENT that sets their own fee on the purported “cost plus” imartgage claims!!! How is THAT remotely a disinterested party? The judge or Hearing Officer SHOULD have reached right out and slapped the speaker silly for assuming ANYONE is dumb enough to believe that one! (4) iMortgage executives clearly never read industry news if they were unaware if Flagstars $200 fees, included a survey of AMC fees. NO ONE ELSE PAYS THAT LITTLE EXCEPT AMCs! They heard about REVAA, and Joan Trice but they never bothered to find out how the surveys were conducted for the C&R fees they are required to pay? (Look up or Google REVAA executives; past and present, Coester VMS, and Joan Trice…hardly independent objective testimonials). (5) Kelker’s efforts to undermine the very reasons Dodd Frank does not permit AMC fees in surveys is pure chutzpah! Not unlike a tax cheat that is sentenced to jail and then complains that it is such a common crime that they shouldn’t be held to a higher standard, or punishment for breaking the law! Mr. Peck notes a nuance within DF that excludes C&R / Independence on transactions where the “principal dwelling of the consumer” is not the primary security. I’m confused (seriously). Just because a transaction was FHA/HUD does not mean the principal dwelling was not primary security. Insurance still only covers a minority portion of the loan and when not paid, the home owner does indeed lose their house. I see where many transactions that are “federally regulated” may indeed be exempted if not principal residences; and I can think of numerous ways for appraisers to deal with this in the future including prohibition clauses against the appraisal being used for any transaction exempted from DF (unless noted otherwise in the report). No doubt Louisiana was caught by many of the hidden bureaucratic double speak ‘nuances’ in all the regulations intentionally inserted by bought and paid for legislators (I am referring to federal in this sentence) that deliberately wrote laws that they knew would be successfully circumvented by attorneys; and in the end render DF nearly unenforceable. It is my sincere wish that ALL complaining parties, including the State of Louisiana now forward a 150 separate complaints to the CFPB for the complaints that the state dismissed, for THEIR investigation. Federal enforcement is not double jeopardy. Additionally, CFPB should be asked to verify if Flagstar’s survey techniques meet DF or any other recognized standard for impartial studies. Maybe if every single appraiser that reads this were to forward a letter of concern to CFPB since this could be affecting many hundreds of thousands of transactions across the entire country. I will compose a letter and publish it here. Joan Trice…. Advocates need to disclose who they are advocating for. I advocate for independent appraisers to be highly qualified, impecably ethical, educated and experienced, and well-compensated for their work; after all, we are the only professional required to be honest in a real estate transaction, and NOT an advocate for any other parties in a real estate transaction. Dodd Frank didn’t touch the problems in this business, and adding another incompetent “third party” who decides what a private business can charge for their work has got to be unconstitutional. How many accountants can’t choose their clientele? Electricians, beauticians and other licensed professions and trades? Working for an incompetent, crooked AMC is pure torture. I have thoughts some days that working for an AMC is cruel and unusual punishment!!! This is great….except that it took 6 years for one case against an AMC to be exposed and convicted of low C&R fees. Glacial speed is right when it comes to this industry, as every appraiser is hoping things will change but they never do. I’m 35 and so glad I left this industry, making more money now with so much more less stress. Not to mention I get off close to twenty weeks a year. Although I’m an optimist, it will still be 10 years before fees are anywhere near where they should be, that’s if the AVM’s don’t replace us. Good luck all!!! Thank you Ryan. If we do not get better organized and stand up for ourselves, we will indeed go the way of buggy whip manufactrers. iMortgage stated fees were based on info from Flagastar Bank….that a load. I am on iMortgages list but I don’t do much work for them because they send the $200-225.00 1004 order which I just ignore. Every now and then a get an order which has Flagstar and the lender and the convention fee is $375 and if it is a conforming property I’ll accept it. Dodd-Frank specifically states that “a creditor and its agent” are responsible for paying customary and reasonable fees. The AMC, which likely dictated these low fees in exchange for large volumes of work, pays the fine and takes the suspension, but the creditor, who is responsible for the actions of its agents will walk away with nothing. While most see this as a victory for appraisers, the banks will just move on to the next AMC and dictate the fees which are paid. The risk and compliance department of iMortgage should also be embarrassed by the defense they put forth. They were unprepared and obviously had no formal policy to support their stance. Agree 100%. We are complaining about the wrong miscreants most of the time. AMCs play a part (usually as the lenders trained lap dog to provide the illusion of impartiality) but it is the originating lender themselves that are the culprits. I avoid doing any business with Flagstar bank or their affiliates except for VA. They are the worst in the business. I too, would love to see Ms. Trice’s survey and how authentic it is. Along with the actual names of who was interviewed and their corresponding statement of the fees they work for. Excellent work by LREAB. This parasitic AMC’s business model was clearly to prey upon desperate appraisers. It looks like the dufus bank paid the C&R fee, then allowed the AMC pirates to steal an absurd portion of the fee from the most desperate appraiser they could find. At last the shameless chiseler parasite AMCs are being officially exposed for what they are: an ethical stain on the industry. They need more than fines – they need to go out of business! I’m seeing fewer and fewer appraisers in my market (Houston) and have AMCs call to add me on thier list often. There is no reason to accept low fees and If we all just turn them down it will force them to be fair or out of business. I’m surprised any appraiser would accept the crap from this AMC. C & R fees are the law. They are part of Dodd-Frank. Any AMC that offers a full 1004in UAD format, with an MC, original comp photos, a scope-of-work that requires review of AMC supplied sales, etc. etc. is in violation of Dodd-Frank. THESE SO-CALLED SURVEYS that they say are taken from appraiser feedback on what you charge are never get authenticated! They are a ploy. I would like to meet the appraiser that fills out a fee sheet when they sign up that says they will work for $200 !